Colin practices Osteopathy, specialising in structural osteopathy. His interest started while he worked as a nurse... initially Colin was being treated for an injury which started his interest in osteopathy. He enjoyed the treatment and well as the care centred approach he received. Colin firmly believes in osteopathy as an excellent treatment and regularly treats family and friends. His experience in osteopathy, combined with his general interest and medical background as a nurse, gives him a great platform from which to approach his clients. 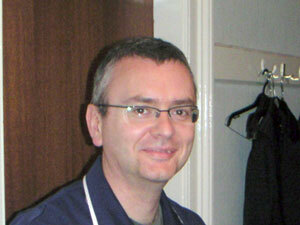 Initially trained as a nurse in London, Colin has a full medical background. He was initially posted in the Communicable/Infectious Diseases Department, mainly working with Haematology patients. After taking an interest in Osteopathy, he studied at the London School of Osteopathy, gaining a BSc(Hons). After his qualification, Colin also took an interest in Cranial Osteopathy. This is a form of osteopathy is particularly suited to children and babies. It has given Colin an excellent chance to further his understanding of the subject. He studied this at Sutherland Cranial College, and uses it as part of his treatments for patients at Maple House Clinic.